Are The Old Ones Returning To Set Thing Right? It was sometime during our time with him that The Abba Father identified himself as one of “The Old Ones” and said that they were even then in the process of returning to Earth. Their mission is to help repair and restore the planet and bring it back to health. They intend to bring to an end a ravaging by a runaway alien dominated society of enslaved humans that has been going on for thousands of years. While the story sounded strange at first, it also made sense after we thought about it. The concept of a race of humans living enslaved under the tyranny of a secret alien race of humanoids that look like us, but using advance technology to maintained the power, wealth and control of the world may be what has been going on for as long as recorded human history. Their tools have included kingdoms, a materialistic monetary system, taxation and corporations that work collectively to maintain control of governments. The extreme events now occurring all over the world . . . first the Arab Spring in the Middle East, the Occupy Movement in the United States, the public revolt on the streets of Moscow and throughout Syria, Iran and in many other nations living under dictatorial and corporate rule are a sign of significant changes looming. And finally we are enduring the Trump phenomenon and other dictatorial "leaders" rising up in other nations. Mixed in with all of this action on the streets has been a strange inability among leadership to lead. The American political movement for the selection of presidential candidates to go on the 2012 ballot has produced a hodge-podge of fools. Not a single candidate is championing a role of true leadership that might inspire voters to bother to show up at the polls. While all of this confusion has been going on, the military leaders of the world appear to be moving closer and closer to all-out warfare. Iran is rushing ahead with plans to become a world nuclear superpower. North Korea’s dictator Kim Jong Il death catapulted his son Kim Jong Un into power. This, the Trump trade war with China and the Chinese decision to build up its military has created new world tension in that corner of this troubled world. Indeed, scientists of the world are rushing to develop new technology in genetics that can alter the natural order of all living things, control the minds of millions, and destroy us all at the push of a button. Not since the cold war have we experienced such perilous times. The Abba Father said there exists a race of beings from another place or dimension that he calls “the Old Ones” who were once on Earth and are now returning. It does not appear that these powers are going to stop the chaos and possible bloodshed that is about to consume mankind. But when the worse is over there will be survivors. The Old Ones will be here to help them return to the original way of life we enjoyed before we suffered an alien invasion thousands of years ago. The materialistic world of enslavement is going to disappear. In effect, humanity will be taken by the hand and returned to Eden. We are not alone in projecting this idea. The late British writer W. R. Drake once wrote that the so-called “Gods of Antiquity” known to the Greeks, Egyptians and other ancient nations were not just illusionary but were real flesh and blood beings who came from the sky and lived among us. Some were here to dominate and control. But others, perhaps those that preceded the alien invaders, were The Old Ones, who helped us evolve into be homo sapiens. Well known writer Erich von Daniken, in his book “Odyssey of the Gods,” examines Greek mythology and suggests that the Greek gods were extraterrestrial beings who arrived on Earth thousands of years ago. 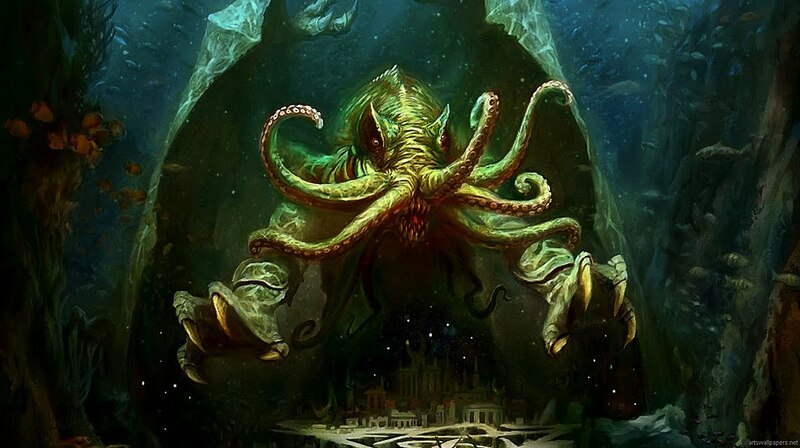 Writer H. P. Lovecraft introduced the concept of the monster Cthulhu when his short story "The Call of Cthulhu" appeared in the pulp magazine Weird Tales in 1928. This creature has remained among the "Great Old Ones" described among occult and science fiction writers. Did Lovecraft have a vision of the Old Ones described by The Abba Father? Other writers have noted that many ancient writings, including those of Aristotle and the Book of Genesis, suggests that these alien “gods” interbred with humans, performed genetic experiments, and produced “men of renown” as well as other mythical beings such as centaurs and Cyclops. The Greek creation story tells how Prometheus and Epimethens were rewarded by the Olympians for not joining forces with the Titans in the war of rebellion. As a reward they were given the task of creating man. Prometheus shaped man from the mud and Athena breathed life into his clay figure. The Genesis story of creation is very similar except that the Creator God was the one that made the clay figure and then blew life into it. Does this story not strongly suggest genetic splicing? That we have learned how to splice the genes of all life forms allows us to consider the possibility that alien visitors may have done the same thing in a very early moment in human history. Did they not turn simple humanoid beings into the spiritual, super men of old that we are today? The rash of UFO sightings occurring all over the world has become so common they usually escape much attention in the contemporary media. That wasn’t the case in the 1950s and 1960s when the sightings, and especially the strange story about the crashed alien ship at Roswell, New Mexico, excited the attention of the world. The crop circle phenomenon also drew special attention for a while but they too have become so commonplace, and declared by some to be hoaxes, that the media mostly ignores them. But they are among us. From all indications, the UFOs have visited us as long as we have had artists who have drawn or painted them. The drawings appear in carved cave art, and even in great paintings by artists who lived hundreds of years ago. Ezekiel’s description of the angelic wheel in the Old Testament appears to be a description of an alien ship landing on Earth. The evidence of alien intervention into the affairs of men is clear. Humans are tearing themselves away from the chains of religious belief systems and waking up to what has been happening to them. This is leading to open conflict in the streets. We are clearly involved in a war against the tyranny imposed by these unwelcome visitors and/or greedy power figures. The question then is: if aliens are living among us, are they all evil or can we believe the Old Ones are really here for our benefit? This occult stuff sometimes boggles the brain.